I have suffered from eczema for as long as I can remember. I had red, itchy spots in the creases of my arms and legs all through my childhood, but it wasn’t until fifth grade – when we were living in hot, humid Singapore and I wore scratchy, polyester uniforms – that it really started to become a problem. Of course, this was long before the invention of the internet, so we couldn’t rely on things like Google and Pinterest to tell us what the best and most effective eczema remedies were. Our options were to slather ourselves in medicated cream or suffer. Looking back, I recognize how fortunate I was that my skin usually responded quickly to whatever creams my doctor prescribed each time I had an eczema flare. I know others aren’t nearly as lucky, and had a taste of how that must feel when I was in the fifth grade. I don’t know what caused my eczema to flare at that particular time, but when I changed out of my school uniform into my bathing suit for swim lessons one afternoon, I noticed a huge red, puffy rash all over my legs. The memory still makes my eyes well up with tears because when I walked out to the pool with my friends, my 6-foot, 7-inch swim instructor took one look at my legs and yelled, ‘YOU’RE NOT BRINGING THAT INTO MY POOL!! !’at the top of his lungs in front of the entire class. He told me to call my mother, who promptly took me to the doctor, and it took many, many tubes of medicated ointment before I would bare my legs in public again. I mostly outgrew my eczema by the time I started high school, but instead of my legs and arms being covered in itchy, pink patches, my right hand now resembles that of an 80-year-old woman, and cracks, splits, bleeds, and itches all. winter. long. The good news is that the internet is FILLED with all kinds of helpful eczema remedies these days, and after working with a dermatologist and allergist, and doing a lot of my own trial and error, I have a lot of great tips and tricks as it relates to treating and preventing eczema. Here are 7 of my favorites. If you or your child suffer from eczema, one of the first things you should do as part of your treatment plan is to get an allergy test to determine if something in the environment and/or a particular food or food group is causing or exasperating the condition. Dust, pollen, grass seed, laundry detergent, and synthetic clothing can all trigger eczema, as can foods like wheat and dairy. An allergist can help pinpoint what (if anything) is causing your skin to flare so you can avoid triggers wherever possible. One of the best eczema remedies I’ve ever tried is to avoid hot water. It sounds so simple, but it’s so effective!!! Even if you apply moisturizer immediately following a shower or bath, washing and bathing yourself in hot water can dry out your skin and strip it of protective oils. Use lukewarm water wherever possible. Soaps, skin products, and detergents with perfumes and dyes added to them can be really irritating to eczema-prone skin, so opt for natural, scent-free products wherever possible. As much as we want to adopt the latest fashion trends, wool and synthetic fabrics can really aggravate eczema-prone skin. For some, wearing a cotton top or undershirt is all it takes to keep their eczema at bay, but others do better if they stick to loose-fitting cotton clothes year-round. I’ve tried more skin care products over the years than I care to admit, and when my eczema is really bothering me, I used to find the only thing that could get it under control was tube of medicated cream from my doctor. I’ve been prescribed many different ointments over the years, and while each has provided immediate relief, I’m not a fan of medicating myself or my family unless I absolutely need to. Manuka Honey Skin Cream: This is my go-to cream year-round, but I especially love it during the winter months. The combination of organic manuka honey and organic tree nut-free oils and beeswax makes this a gentle, nourishing formula that soothes and calms irritated skin and reduces inflammation without a burning or stinging sensation. Top with a pair of Eczema Gloves (click HERE for adult gloves and HERE for child gloves) at night for added protection and to prevent nighttime scratching! Emily Skin Soothers for Itchy Eczema: Suitable for babies, kids, and adults, this is another soothing cream I swear by. Made from all natural ingredients – olive oil, beeswax, and 3 Chinese herbs – I love how quickly it soothes my skin and removes redness. Emily Skin Soothers for Red Eczema Rashes: If you or your little one are plagued by red, oozing, inflamed, and angry-looking eczema, this product is a must-try. It heals weeping dermatitis, and can also relieve irritation in skin folds such as armpits, elbows, and behind the knees. EczeHerbal #2 – Itchy Skin Rash Treatment: If your eczema causes dryness, flaking, and itching, this is another of my favorite eczema remedies. It uses different herbs, which isn’t for everyone, but having grown up in South East Asia, I’m a big believer in Traditional Chinese Medicine (TCM). To each their own, I say! I’ve already touched on the importance of getting an allergy test as a first step in treating and preventing eczema, and while grains and dairy are known to make eczema symptoms worse, eggs, nuts, seeds, and soy can also trigger an eczema flare. It’s definitely worth talking to your doctor or allergist about potential foods you should avoid and to do a bit of trial and error to see if diet has an impact. I’ve read conflicting views on the role stress plays on eczema. Some say it’s a trigger, others aren’t sure. From my own personal experience, I have noticed that my skin bothers me more when I’m feeling anxious and overwhelmed, and I’m a big proponent of proper stress management regardless of the condition of your skin! Here are some great tips and activities to improve your emotional health! If you or someone you love suffers from red, raw, inflamed, and itchy skin due to eczema, I hope one (or more!) of these eczema remedies helps. Remember to be patient, to try one remedy at a time so you can properly evaluate whether it helps your symptoms or makes them worse, and to never give up. You CAN find a way to relieve your eczema naturally! 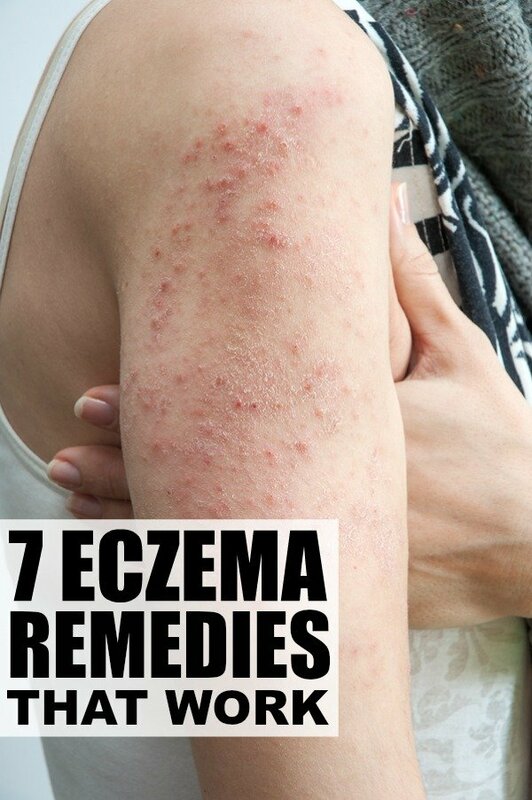 If you found these eczema remedies helpful, please share them on Pinterest! And if you’re looking for more health-related tips and tricks, please follow our Health board where we share all kinds of great finds!